When he lands in North Korea, even Google's executive chairman will likely have to relinquish his smartphone, leaving him disconnected from the global information network he helped build. Eric Schmidt is a staunch advocate of global Internet access and the power of Internet connectivity in lifting people out of poverty and political oppression. This month, he plans to travel to the country with the world's most restrictive Internet policies, where locals need government permission to interact with foreigners _ in person, by phone or by email _ and only a tiny portion of the elite class is connected to the Internet. But his visit may be a sign of Pyongyang's growing desire to engage with the outside world. North Korea's young leader, Kim Jong Un, talks about using science and technology to jumpstart the country's moribund economy, even if it means turning to experts from enemy nations for help. In recent years, ``North Korea has made a lot of investment in science and technology, not just for military purpose but also for the industry and practical reasons,'' said Lim Eul-chul, a professor at South Korea's Kyungnam University. Google's intentions in North Korea are not clear. Two people familiar with the plans told The Associated Press that the trip was a ``private, humanitarian mission.'' They asked not to be named, saying the delegation has not made the trip public. Schmidt will be traveling with former New Mexico Gov. Bill Richardson, a seasoned envoy, and Kun ``Tony'' Namkung, a Korea expert with long ties to North Korea. "Perhaps the most intriguing part of this trip is simply the idea of it,'' Victor Cha, an Asia expert who traveled to North Korea with Richardson in 2007, wrote in a blog post for the Center for Strategic and International Studies think tank in Washington. But this trip will probably be less about opening up North Korea's Internet than about discussing information technology, Lim said. North Korea may be more interested in Google services such as email and mapping, as well as software development, than in giving its people Internet access, he said. 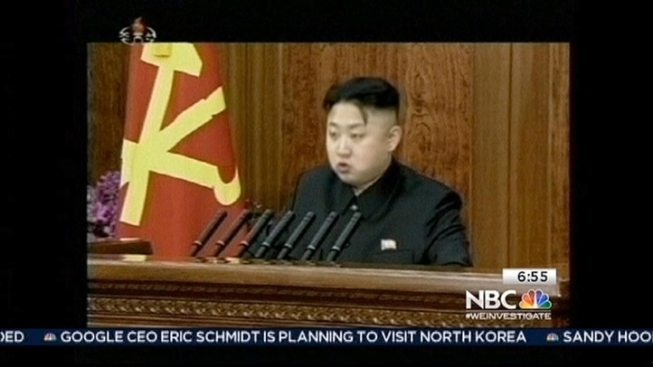 Kim Jong Un, who took power a year ago, has stressed the need to build North Korea's economy. In the early 1970s, communist North Korea had the stronger economy of the two Koreas. But North Korea's economy stagnated in the wake of the collapse of the Soviet Union as the regime resisted the shift toward capitalism in the world around it. By 2011, North Korea's national income per capita languished at about $1,200 while South Korea's was $23,467, according to the Bank of Korea in Seoul. And as the Internet began connecting the world a movement South Korea embraced North Korea reinforced its moat of security. Travelers arriving in Pyongyang are ordered to leave their cellphones at the airport and all devices are checked for satellite communications. Foreigners and locals are required to seek permission before interacting in person, by phone or by email. However, leader Kim Jong Un declared Monday that North Korea is in the midst of a modern-day ``industrial revolution.'' He is pushing science and technology as a path to economic development for the impoverished country, aiming for computers in every school and digitized machinery in every factory. More than 1.5 million people in North Korea now use cellphones with 3G technology. But giving citizens open access to the Internet has not been part of the North's strategy. While some North Koreans can access a domestic Intranet service, only a select few have clearance to freely surf the World Wide Web. Schmidt speaks frequently about the importance of providing people around the world with Internet access and technology. As Google's chief executive for a decade until 2011, Schmidt oversaw Google's ascent from a small California startup focused on helping computer users search the Internet to a global technology giant. Google now has offices in more than 40 countries, including all three of North Korea's neighbors: Russia, South Korea and China, another country criticized for systematic Internet censorship. After being accused of complying with China's strict Internet regulations, Google pulled its search business from the world's largest Internet market in 2010 by redirecting traffic from mainland China to Hong Kong. Son Jae-kwon, a visiting scholar at Stanford, compared Schmidt to Chung Ju-yung, the late founder of the South Korean conglomerate Hyundai who strode across the DMZ dividing the two Koreas with a pack of cattle in 1998. But this time, it's computer technology, not cows. The Richardson-Schmidt trip comes at a delicate time politically. In December, North Korea defiantly shot a satellite into space on the back of a three-stage rocket, a launch Pyongyang has hailed as a major step in its quest for peaceful exploration of space. Washington and others, however, decry it as a covert test of long-range ballistic missile technology designed to send a nuclear-tipped warhead as far as California. The U.N. Security Council quickly condemned the launch, and is deliberating whether to further punish Pyongyang for violating bans on developing its nuclear and missile programs. The visit also follows North Korea's announcement that an American citizen has been jailed in Pyongyang on suspicion of committing ``hostile'' acts against the state. Richardson will try to address his detainment, the sources said. Washington and Pyongyang do not have diplomatic relations. North Korea and the U.S. fought on opposite sides of the three-year Korean War before signing a truce in 1953. However, North Korea has indicated interest in repairing relations with Washington. In 2011, a group of North Korean economists and diplomats visited Google headquarters in Mountain View, California. And North Korean-affiliated agencies already use at least one Google product to get state propaganda out to the world: YouTube.